Giant monster hamster trashes town, on The Feed! Some of the latest and greatest viral videos include a tiny hamster becoming a giant monster and a mashup of 25 super catchy company jingles. First up, HelloDenizen shows New York City what a real rodent problem looks like with the newest installment in their tiny hamster series. 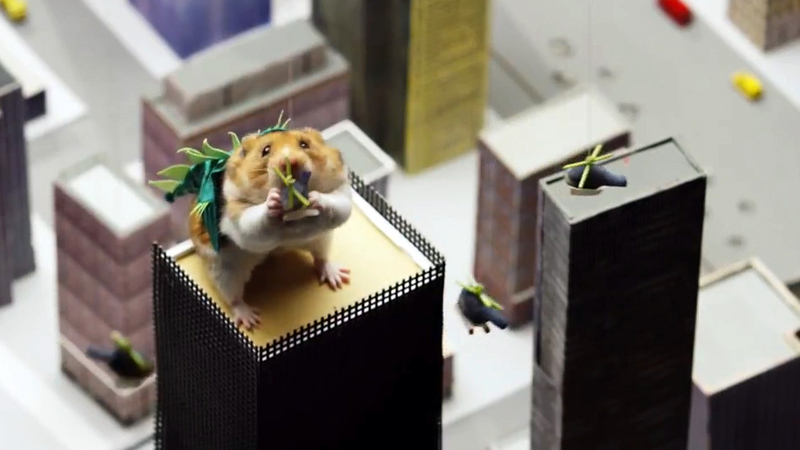 In this video, the little guy comes into contact with some "evil green ooze," and goes on an all-out, city-eating rampage -- a story that is also the plot of the hamster's debut photographic picture book titled "Tiny Hamster is a Giant Monster." In an ode to those commercial jingles that get stuck in your head, musician and YouTuber Grant Woolard seamlessly stitches together 25 of them in this video. And, to top it all off, he performs the catchy tunes with the actual product for which the tunes were written.